Most people with CI don't know that they have it! Take the Convergence Insufficiency Symptom Survey! We screen for convergence efficiency in our Comprehensive Eye exams and can help solve the problem via vision therapy! When our two eyes incorrectly team together, to make a single image, symptoms like double vision, headaches, poor depth perception, and tired or sore eyes may occur. Theses symptoms can significantly handicap ones reading and learning abilities and are often linked to a condition known as convergence insufficiency (CI) or double vision. What is Convergence Insufficiency ? 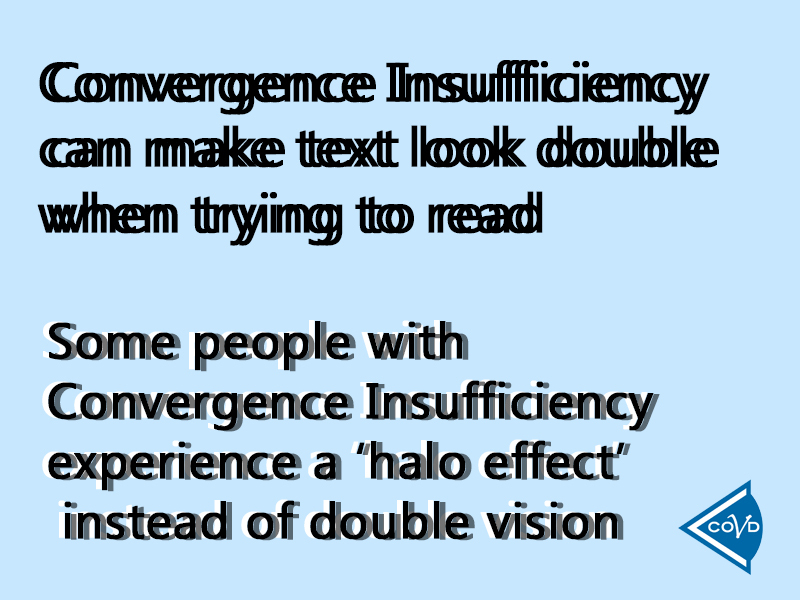 Convergence insufficiency (CI) is a common visual condition in which the eyes do not work as a team. Eye Teaming comes from the eyes aligning with each other accurately to form a single 3D image. CI may occur in children and adults. Symptoms often include difficulty in reading, avoidance of near work or poor concentration. A person with CI may experience double-vision (overlapping words) while reading, loss of place, headaches, tired eyes, and poor reading comprehension. Difficulty keeping numbers visually aligned can affect math skills. These symptoms can cause a child to be misdiagnosed as learning disabled or as having ADD. Vision therapy treats the deficient visual skills and when the true source of their struggles is removed, school performance improves dramatically and problem behavior is significantly reduced if not eliminated. Failing students become A and B students because the obstacles to their success have been removed. In 2008 the National Eye Institute (NEI/NIH) released the results of a country wide, multi-center research study designed to look at methods of treatment for convergence insufficiency. The conclusions of this objective, scientific, NIH sponsored study is that office-based vision therapy is the most effective treatment for CI when compared to all other methods studied. Here at Yorba Linda Optometry and Beyond, we treat CI and other vision deficiencies that interfere with learning (such as eye focusing, eye tracking, and visual processing) using a highly personalized approach of working one on one with each child or adult under the direct supervision of our doctors. Our treatment room is state-of-the-art and uses technology and cutting edge procedures that integrate body and mind for the highest level of success and patient engagement. We incorporate balance, hand eye coordination, movement, auditory processing and cognitive abilities. A few weeks into treatment, our patients are instilled with confidence as they begin to obtain improved academic abilities and coordination skills and a greater sense of calmness and hope. After treatment, they are empowered to meet challenges with the confidence and ability that had eluded them before their condition was diagnosed and effectively treated. Do watch this video for more information, courtesy of TheVisionHelp.